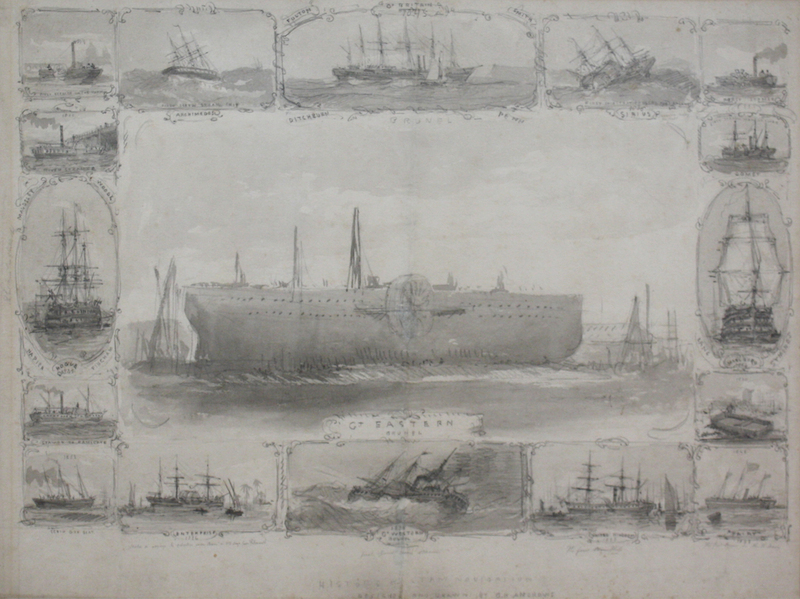 The Brunel Hawes Archive was successfully sold by Toovey’s in November 2010. The sale made national newspapers including the Daily Mail and Daily Telegraph, and was even a topic of discussion by the National Trust in a fascinating blog post. Since the single owner auction it has been well reported that Toovey’s have established themselves as the leading auctioneers in the successful marketing and sale of items relating to the Brunel family. As the main port of call for selling items relating to Sir Marc Isambard Brunel and his son, Isambard Kingdom Brunel, it is unsurprising that an array of related items have gone under the gavel at our Spring Gardens auction house. Items offered for sale since the Brunel Hawes Archive include ‘The Great Eastern ABC’ (featured in a previous blog post), that sold for £9000. In the same auction a slightly tatty copy of the scarce publication ‘A Complete History of the Great Eastern‘ sold for £800. This fascinating pamphlet published by the Liverpool department Store, Lewis’s, advertised the ship’s final use as a floating music hall. A mug and nursery plate commemorating the Thames Tunnel sold for £580, showing the demand is not just for I.K., but for his father, Sir Marc, too. 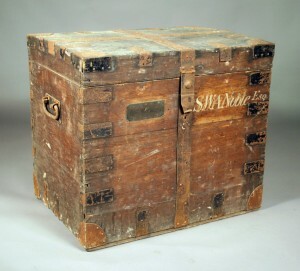 Among the slightly more unusual items offered was a silver trunk that once belonged to the famous engineer Isambard Kingdom Brunel which also beared the marks of his granddaughter’s husband Saxton William Armstrong Noble, who coincidently, was also an engineer. 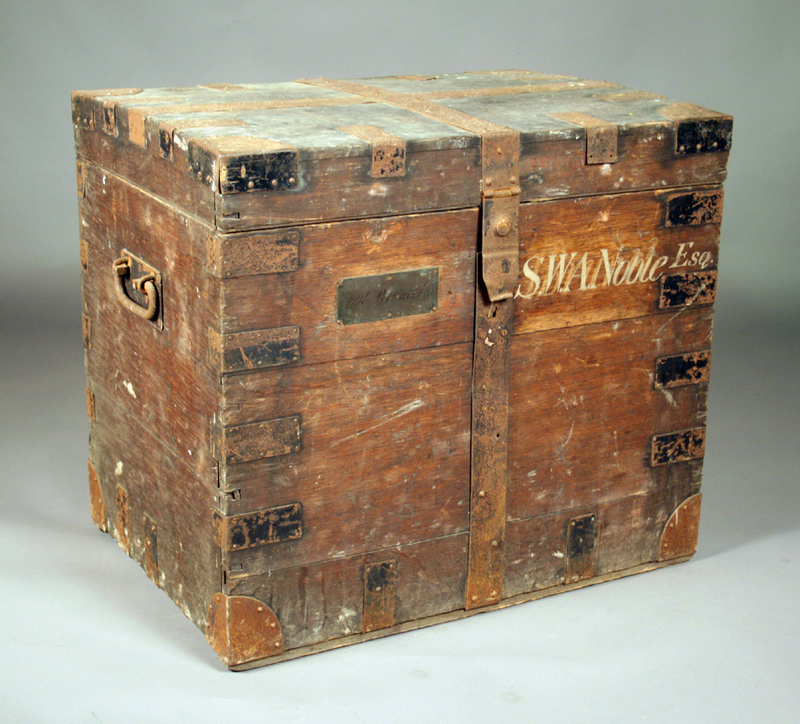 The oak and metal bound trunk sold for £1750 in March this year. In April, a fascinating and possibly unique group of seven magic lantern slides were sold for £5800. Each documented the last few days of the Great Eastern and included views on deck with items grouped as lots prior to the breaking up of the ship in 1889. 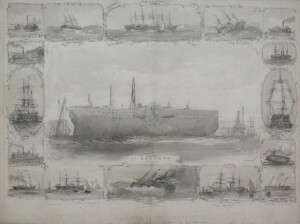 Two months later a mid-19th Century watercolour was consigned, titled ‘History of Steam Navigation‘, this monochrome watercolour by George Henry Andrews was probably a preliminary drawing for the ‘Illustrated London News’ for whom the artist worked for. The central view was of the S.S. Great Eastern but surrounding this was smaller titled vignettes including I.K. Brunel’s other ships the Great Britain and the Great Western. This original work sold for £3200. The most recent offering of “Bruneliana” appeared in August as part of the auction of Paper Collectables. A concertina style optical toy peepshow of the Thames Tunnel from the Wapping Entrance sold for £1100. Over the last two years a variety of photographs relating to Isambard Kingdom Brunel and his engineering triumphs have also featured in Toovey’s auctions and always attract considerable interest, more of these are already consigned for the Sale of Paper Collectables on 6th November. Some people might wonder why these items appear in Sussex when the Brunels are much more associated with Bristol and London. The days of internet advertising and Toovey’s direct marketing mean that successful sales of “Bruneliana” can be held in Sussex. These items have sold to private collectors, specialist dealers, institutions and investment corporations across the country. As the Antiques Trade Gazette reported on the 24th March “The Sussex village of Washington has to a very large degree become the preferred point of sale for Brunel material in recent times.” Those still wanting a tenuous link with the Brunel family and Sussex however, can find one in the schooling of Isambard Kingdom. Between 1816 and 1820 the young, future engineer attended Dr Morell’s Academy in Hove, where it is believed he nearly choked on a half sovereign. As a result of this local connection the Brighton & Hove 673 double-decker bus is named after the famed engineer – an arguably useless piece of trivia to finish with!